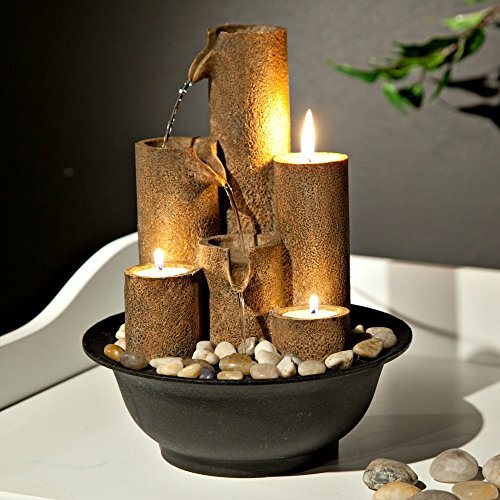 INDOOR ZEN FOUNTAIN: 3-tier water fountain transforms your space into a restful oasis. Interior pump keeps the water flowing - just plug it in! 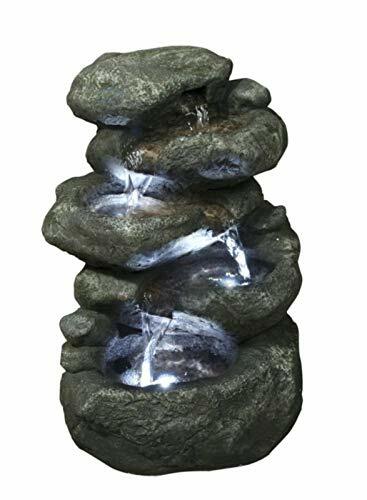 Turn on the EnviraScape Fountain when you re feeling anxious and exhausted after a hard day at the office. Let the soothing sounds of water melt all your stresses away. Add rocks (not included) to the bowl for a more natural look. Measures 8 diameter x 10 high. Indoor use only. 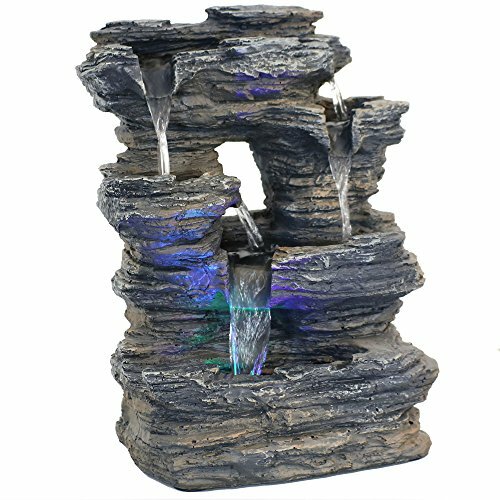 This durable resin indoor fountain is carved to look like a real rock waterfall. The soothing sounds it creates will have you relaxing in no time! The fountain features padded feet to protect your table or desk and natural, detailed coloring. The electric fountain pump enables the gently flowing water to flow from the top tier all the way down to the bottom pool where it then recirculates back through the feature. This table fountain also includes LED lights that help to illuminate the fountain and makes the water glimmer and elegantly reflect off of surrounding surfaces. 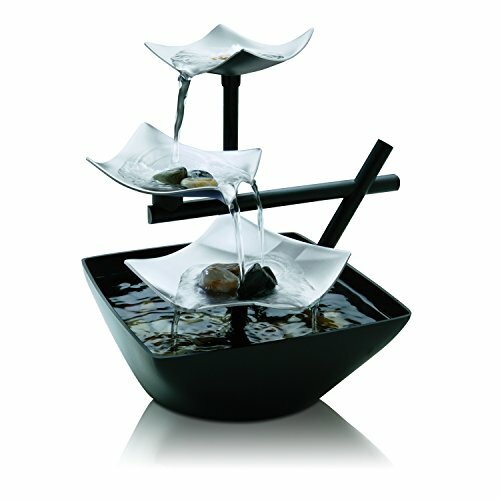 Add this tabletop water fountain to any home's interior design for a beautiful, natural accent. The flowing sounds of the rushing water are sure to instantly relax guests and loved ones while adding a unique decor piece. Water flows from the top, down the multiple tiers to the bottom pool where it recirculates with help from a submersible electric pump. Plus, there are 4 colored LEDs in the light located in the bottom basin, one red, one yellow, one green and one blue light! Because of the electric pump, no plumbing is required, simply add water, plug it into a standard electrical outlet indoors and it is ready to go! Sunnydaze Decor is a manufacturer of high-quality home and garden products. They travel the globe to find the most innovative and beautiful products for your interior and exterior living space. The goal is to provide you with products that truly calm, relax, and bring peacefulness into your life and home. Their talented designers create high end products using a manufacturing process and materials that leave you, the valued customer, with a beautiful addition to your home. They pride themselves on providing customers with a vast selection of products available in a variety of different colors and styles to ensure that you are able to find items and accessories that perfectly match the style and theme of your home's personality. 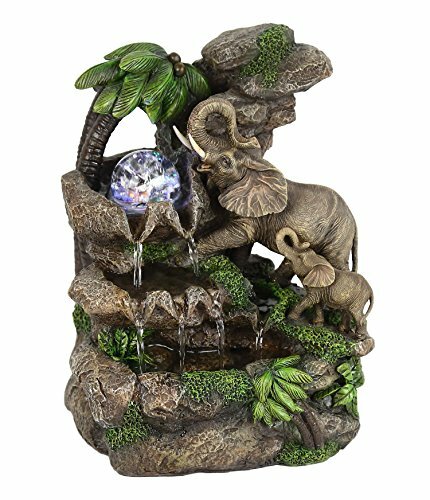 This lovely table fountain features a mom and baby elephant wandering through a scenic landscape with palm trees. Creates a soft and soothing sensation. The crystal-like Ball rotates and reflects the color changing LED light. Water cascades from and down the Ball. Made of Polyresin. Great affordable, inexpensive gifts for any occasion such as Mother's & Father's Day, birthdays, retirement, housewarming celebration, engagement parties, anniversary gifts for parents, relatives, friends, Get well gifts, boss / employee / co-workers, or perfect for any Holiday season. Also makes an easy grab and go gift for those last minute parties / get together. Fantastic for indoor home or office decor. Wonderful for relaxation and enjoyment of listening to soothing sounds of rainfall of the LED Fountain. Enjoy the water falling effects that look beautiful in a dim room or in the evening in the outside patio table. It will enhance any kitchen counter / table, fireplace, coffee table, dinner table, patio table, front desk, night stand, in or on top shelves. Just simply insert batteries OR plug in the 3 volt adapter and add water for a peaceful, soothing effect that compliments any decor. Intended for indoor use. 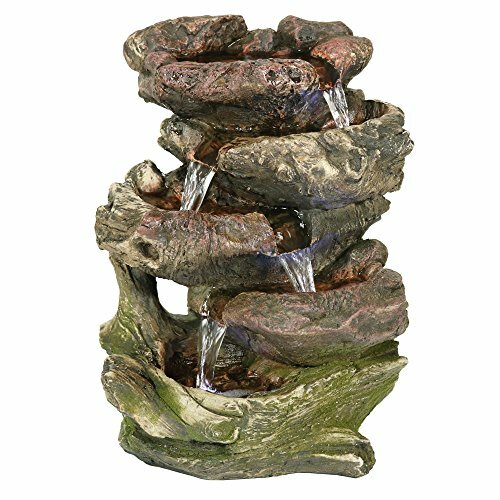 Create a soothing and relaxing space with this beautiful water fountain. 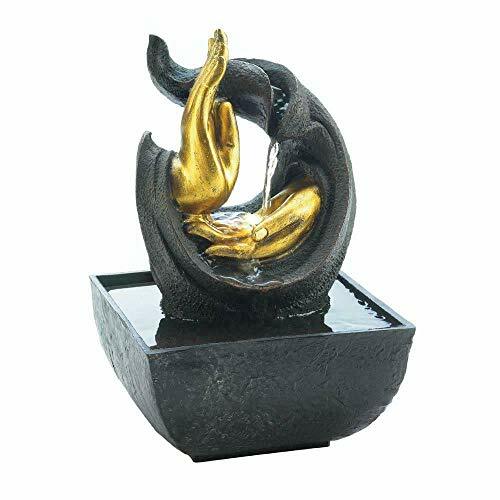 Ideal for indoor use, the fountain will add a decorative touch to any decor. 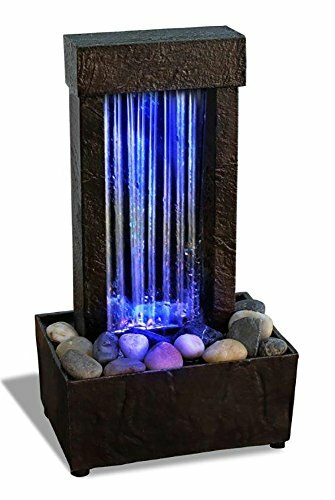 TABLETOP FOUNTAIN: Relaxation Fountain on display to bring a calming, place it to anywhere. It is just the right size to add a decorative accent to any tabletop, bathroom sink, and vanity or office desk. The tiers create several streams of water creating a gentle soothing sound of water. The water flow replicates the sights and sounds of a tranquil spring. 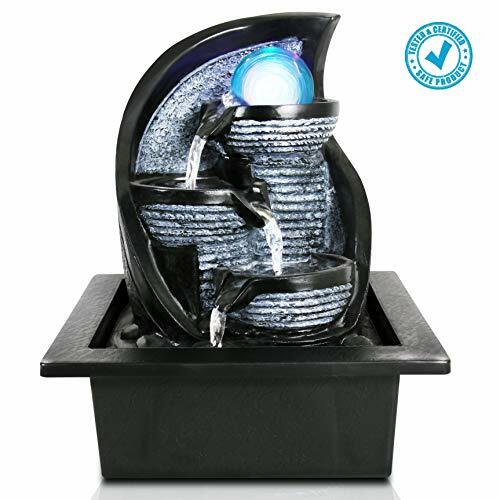 EASY TO USE: The Illuminated Water Fountain was designed with a quiet built-in submersible pump. Simply fill the basin to the water-fill line and enjoy the soothing effects of this fountain. The pump circulates the water, keeping it clean and free of algae build-up. Unlike other fountains, this Relaxation Fountain has an on/off switch. Plug the power cord into an outlet and turn your fountain on. When you want to shut it off, just flip the switch. DESIGN: This Asian-inspired fountain features a Tree Trunk that water streams down. Its extra-deep, open-styled basin allows for the serene sounds of cascading waters to fill your home. It was designed with a unique lighting feature that creates a soft reflection of the natural flow of fresh running water. The illuminating glow creates a romantic ambiance. 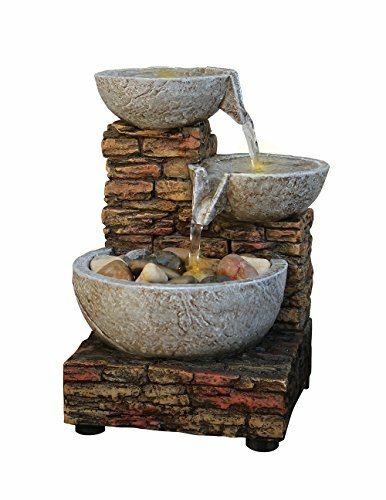 STRESS FREE : This fountain can be used to de-stress and unwind after a hard day. Turn on this fountain before bedtime and drift off to sleep as you listen to its sounds of a peaceful running stream. Put it in your baby's nursery so they can enjoy its sounds of a gentle brook and its soft glow as a nightlight. Use it while you are trying to meditate or perform yoga. You can even put it on your cubicle desk to center yourself while at work. WHAT'S INCLUDED WITH YOUR PURCHASE:One power cord and adapter. One pump cover, water pump, and fountain base. One instruction manual. 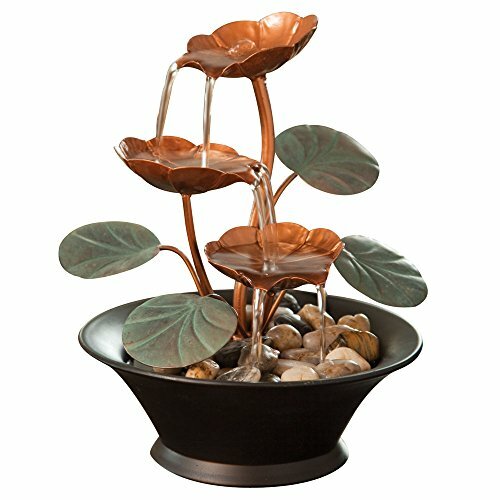 There's nothing more soothing than the sound of a water feature, and this decorative fountain is no exception. 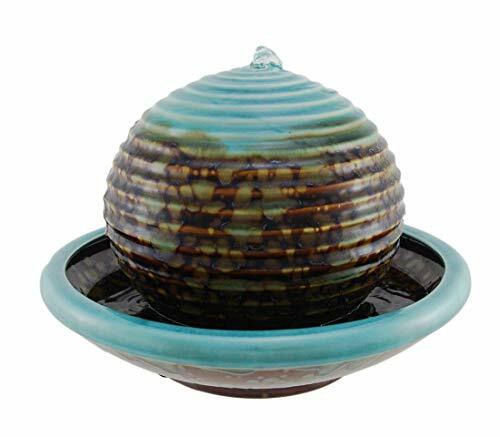 Sculptural and unique, this spherical bowl piece in beautiful turquoise and brown overflows with water from the top as it cascades down the ribbed spherical surface. Measures 12"W x 8"H.
Arin Shop Table Fountain Gold Hand of Buddha Thai Hindu Massage Statue Lighted Meditation Table Fountain Measures 5.25" Across x 5.25" x 8" high. 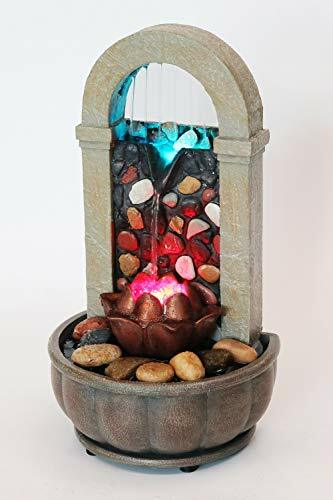 Add peaceful flowing water and shimmering LED-powered light to your living space with this calming fountain. 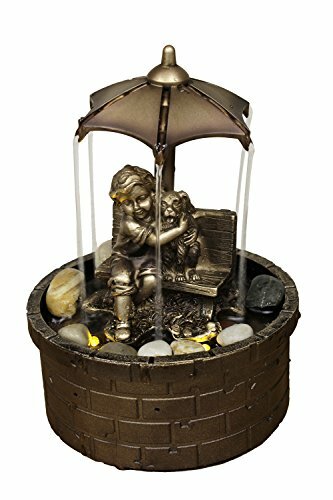 The beautiful architectural design of this water fountain will complement any decor and give soothing solace to all who gaze upon it. SMALL SIZE - measures 5.25 across x 5.25 x 8 high. Electric pump included; 120v, 60 HZ.